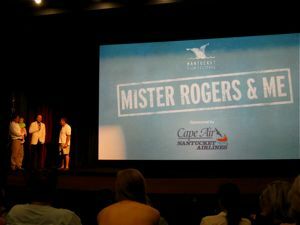 Difficult to imagine, but it was one week ago today that “Mister Rogers & Me” finally made its way from a conversation in Madaket to a world premiere at the Nantucket Film Festival. And I don’t know for sure, but by the time the lights dimmed in the Nantucket High School auditorium, it’s safe to say I’d watched the 82:50 documentary at least one hundred times. Still, to say this screening was different would be an understatement. This was it! This was our baby meeting the world for the first time. Other than starting our day as guests of Nantucket Film Festival’s “Morning Coffee With…,” Chris and I spent the afternoon like any other day off. We knocked out a solid 10k run around town, and then had lunch (lobster rolls all around) with my college pal, Fish (from whom I first learned about the enchanted, little island thirty miles off the coast of Massachusetts). After reading and quickly posting Gene Mahon’s terrific endorsement of our film, I quaffed a Cisco Brewers’ Whale’s Tale Pale Ale while dry-running my dirty laundry-themed story for Late-Night Storytelling. Before I knew it, our 1929 Ford (courtesy of NFF, natch) was beckoning from The Beachsider driveway. When we pulled up to the high school, there was a line out the door and half-way across the parking lot. We gathered our entourage, some twenty-or-so strong with parents and friends, plus Mister Rogers’ son, John (and friends) and one of the film’s “characters,” Beverly Hall (and her’s). After posing for a group photo for local journo (and “Mister Rogers & Me” advocate, Gene Mahon), we were ushered inside. Nantucket High School’s Mary P. Walker Auditorium is state-of-the-art theater. It’s a massive space with with some 600 seats, high ceilings, wrap-around audio baffling, and top-notch audio and video (I imagine the island has a pretty solid tax base). The room was more than half-full, and — were I to characterize its tenor — grinning in anticipation. Chris and I heard a few stories and posed for a few photos, then mounted the stage. I told those assembled that we’d always wanted to world premiere at NFF (applause), thanked everyone for coming (applause), then raced back to my seat in the exact aural and optical center (natch!). Having attended Sundance a handful of time over the years (always for work, but always doing recon for myself), I’d often envied those filmmakers whose movies took those cool, brief, festival-centric intro animations before screening. What a thrill, then, to see a flickering whale’s tale amidst a rolling seascape resolve into the NFF logo. We’d arrived! Not one second of screen time is accidental; we chose every frame. Odd as it might sound, some of my favorite moments in our film are the credits. I’m particularly proud of our Wagner Bros. title sequence, not only because of the logo (derived of a 35-year-old photo of Chris and I climbing a tree), but because if the precise audio mix Chris created for it: crickets, wind, and children’s laughter. It gets me every time. I’ll afford you no spoilers, but will say that it was fascinating, exciting, and anxiety-provoking to listen to the audience laugh and gasp in real time. I was motionless for the first few minutes, praying that the tape wouldn’t break or the audio drop out. To the contrary, the HD picture was pristine. From Brant Point to Smith’s Point, Nantucket looked gorgeous. And the audio mix — completed less than a week prior by Dan Ricci — was gorgeous; one would never know that the voice over was recorded, not in one fells swoop, but over the course of weeks. It dawned on me only now, a week later, that I should have been anxious about seeing myself on the big screen. True, there are a few outfits I should have more carefully considered. And true, one can pretty much watch me lose my hair over the course of the film. But — maybe it’s all the music videos Chris and I have done over the years (“New York,” “The Rest Of My Life,” “Here Comes Your Man” among others), or maybe my Hope For Haiti Now cameo — it didn’t even occur to me. Instead, I sat ticking away the segments in my head, rolling over all the context — the booking, travel, side conversations, licensing considerations and hours of unused footage — that made each interview segment unique. And as the end approached, I waited on the edge of my seat; I couldn’t wait for a real, live audience to experience our conclusion! As the credits rolled (to Casey Shea’s inspiring “Love Is Here To Stay”) and the audience applauded (for a solid minute or so, I might add), I climbed from my seat to meet festival co-founder Jonathan Burkhart for our Q&A. Christofer was missing as I walked into the spotlight, then bound from the wings with his daughter, Ella, in his arms. I don’t remember much of the Q&A, only that the questions were long, plentiful, and substantive. Towards the end, Mister Rogers’ son, John said, “My dad would be proud.” And before we spilled out into the half-light of dusk, the entire audience sang John “Happy Birthday,” just as his father had to me when our story began some nine years prior. Great post. I seriously can’t wait to see it. Need help planning the NYC premiere? It appears like pleasant submit, on the other hand it just a single side of the medal. Good reading anyway, I constantly appreciated excellent brain teaser and solid amount of great information. What a funny blog! I genuinely enjoyed watching this comic video with my relatives as well as with my colleagues. You’ll be able to definitely see your skills in the function you compose. The world hopes for a lot more passionate writers like you that are not afraid to mention how they think. At all times follow your heart.